One of my New Year's resolutions is to use my pressure cooker more. I got it last spring and was so excited about all its potential. I made a wonderful spring risotto and then...nothing else. This year I will do better. This week is pressure cooker week. 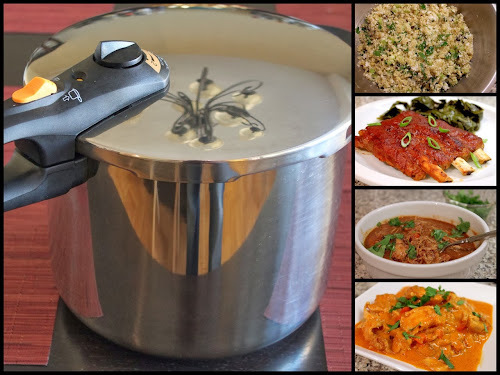 Kicking it off today is an equipment post on what you should know about pressure cookers with a focus on my model, the Fagor Duo 10-Quart. There's also a recipe for Pressure-Cooked Quinoa Salad with Cauliflower. Later in the week I'll follow with recipes for Chicken Mole Chili, Barbecue Spareribs and Chicken Paprikash. Many of those sounds like recipes that could take all afternoon to produce, but with a pressure cooker, most of them are manageable even on a weeknight. Pressure Cooker Perfection. Published last year by America's Test Kitchen, this collects many of their pressure cooker recipes with additional good content about pressure cookers and how they work. The Pressure Cooker Cookbook by Laura Washburn. Another good cookbook of recipes tailored to pressure cookers. Modernist Cuisine at Home by Nathan Myhrvold. Not a pressure cooker cookbook per se, but this adventurous cooking text includes quite a few recipes for which a pressure cooker is essential. Miss Vickie's Pressure Cooker Recipes. A great web-based source of recipes and other pressure cooker information. ePressure Cooker.com. I have a stovetop pressure cooker, so the recipes I'm featuring this week are based on that. However, if you're interested in the electric alternative, here's a site with a lot of great information and recipes.